Andrea & George Miller and CALL/City as Living Laboratory Invite you to a dinner and conversation with Artist Alexis Rockman and Environmental Scientist John Waldman, discussing the powerful role artists, in partnerships with scientists, can perform in helping us understand nature in the urban environment. Afterwards, artist Bob Braine will present Estuary Tattoos a project to build awareness of and advance the daylighting of Tibbetts Brook. Invite you to a dinner and conversation with Kate Orff & Cynthia Rosenzweig with Mary Miss discussing the role of designers, scientists and artists in addressing the most pressing issue of our time – climate change. Join us in imagining the future of Tibbetts Brook at the Bronx Green Fair! Join us in imagining the future of Tibbetts Brook at Marble Hill Houses! Join us in imagining the future of Tibbetts Brook on the rooftop of the Marshall’s parking lot, overlooking the Harlem River! Join us in imagining the future of Tibbetts Brook at Van Cortlandt Lake! Join us for a Celebratory Launch of Finding Tibbetts and Estuary Tattoos! We'll be gathering at the Van Cortlandt Park Tennis Courts, the site of Finding Tibbett's construction, to check in with SLO Architcture on the progress and learn more about the wetlands. 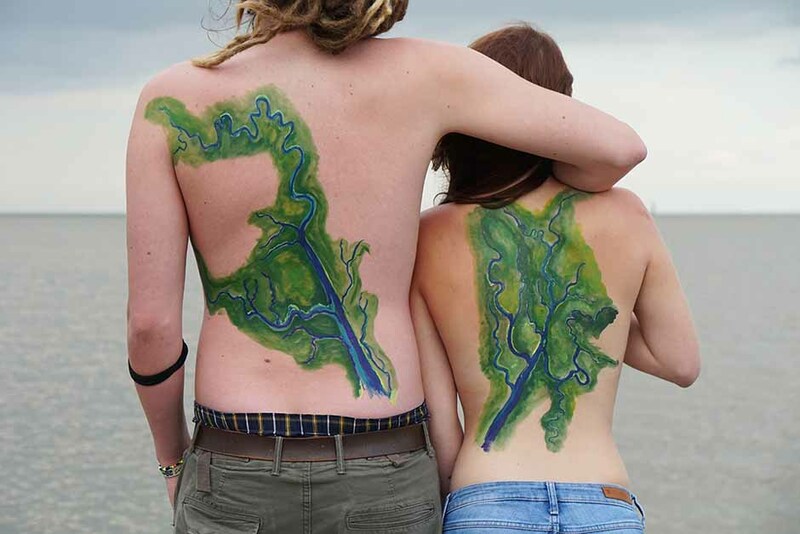 Bob Braine will be on site with the first official Estuary Tattooos live body painting event, mapping the history and trajectory of the estuary on attendees. We'll also hear from other local partner organizations and stakeholders who are joining in the Daylighting efforts. Maintaining affordable housing sustainable is a struggle for building owners in Chinatown, with high costs and low returns. What can be done to preserve affordable housing AND ensure it is sustainable? Joyce Hwang and Prathap Ramamurthey lead a heat-mapping walk through Chinatown, followed by a conversation with local leaders and Community Land Trust activists. This event is free to attend for current CALL Fellows and $25 for the public. Workshop on easy-to-grow local herbs and their medicinal properties. More info and registration to come. In this workshop, Artist Jean Shin will help participants to create dynamic sculptures that also function as stackable, vertical gardens for distribution of Chinese Medicinal plants. Registration for this workshop is now closed. Explore the vast network of water, wastewater and stormwater infrastructure in the Walker Square area with Paige Peters, an environmental engineer and founder of Rapid Radicals Technology, and Colin Matthes, a visual artist whose work addresses environmental crisis. Vote for the Manhattanville Community Hub in Council Member Mark Levine's 2018 round of Participatory Budgeting! CALL hosts quarterly forums for members of our Fellows Program. These forums delve deeper into the issues that surround our work. Our next Fellows Forum, on November 16th, features Peggy Shepard, Elliott Maltby and Louis Bailey discussing design, emergency preparedness, and how urban communities can together face the ecological challenges confronting our cities. If you are not a member of the CALL Fellows Program, and would like to join, you can join here.